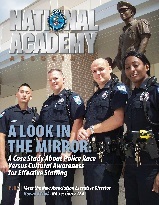 The National Academy Associate is the magazine of the FBI National Academy Associates, Inc. Reproduction of any part of this magazine without express written permission is strictly prohibited. The National Academy Associate is published bi-monthly. Email editorial submissions to Suzy Kelly: skelly@fbinaa.org. Submissions may vary in length from 500-2000 words, and shall not be submitted simultaneously to other publications. FBINAA Chapters, please email information for Chapter Chat to Susan Naragon: snaragon@fbinaa.org. Click on the magazine covers to view each issue in Flipping Book or you may download a PDF.